The next generation in cyber security. Protect your business with our managed security service. The risks associated with managing your technology and valuable data are increasing daily. – some with malicious intent, others the result of human error. The potential consequences of security breaches don’t bear thinking about. and loss of customer confidence. A comprehensive and integrated security solution is essential to protect your IT network, your assets and your business. Our qualified Offensive Security Certified Professional (OSCP) Security Analysts will perform a security audit and gap analysis on your business systems to establish your cyber security needs and implement best-in-class security measures to fill the gaps and mitigate the security risk to your business. We’ll expose and fix the vulnerabilities in your system before anyone else does by performing penetration and phishing tests bi-annually. Our fully-qualified ‘ethical hackers’ employ the same tricks as real hackers to identify and prioritise security weaknesses. Our Security Analysts will work with you to certify your business to Government backed Cyber Essentials standards and GDPR Readiness. 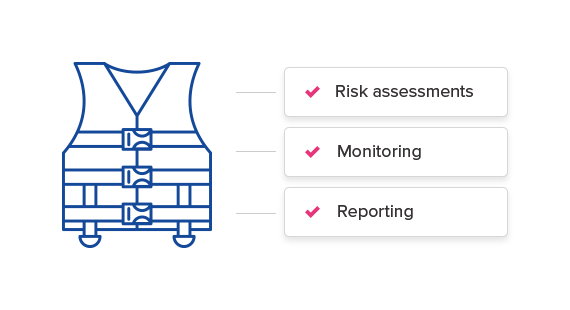 We'll help define your IT policies and procedures to help mitigate risk of non-compliance fines and provide Data Protection governance. Our managed security service continually monitors and manages your systems to safeguard against anything which will compromise compliance. Everything from viruses, spam and ransomware through to protecting you from accidental or malicious employee actions. 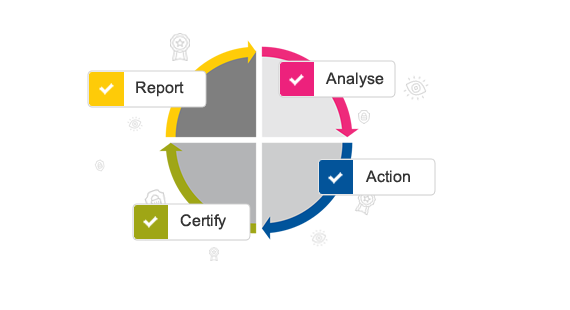 By benchmarking and standardising your approach to security through certification. We will assist and support you through the risk assessments involved for Cyber Essentials certification and GDPR Readiness certification. We’ll help you implement security solutions that demonstrate your credentials and gain customer trust. It’s not just about certification. Our Security Analysts are continually evolving the service by standardising processes, reducing risks and reacting to industry influences. Everyday requests for change are met with stringent checks and reporting keeps you informed of your state of security. In the unfortunate event that there is a breach of personal data we will manage the incident on your behalf and provide the necessary compliance evidence reports requested by the Information Commissioners Office (ICO). OSCP qualified Security Analysts provide necessary expertise to protect your business from the latest threats. Vulnerability testing and gap analysis to identify areas where security needs to be improved. Best-in-class security measures to standardise and safeguard against threats to compliance. Secure software and system privileges to only do their job and nothing more. Evidence based reporting for regulatory purposes and annual security compliance reviews. Rubber stamping your security protection regime with Cyber Essentials, a Certified Government backed security standard. Assistance with gaining current regulatory requirements for your industry and GDPR. "You hear stories in the media almost daily about the latest hack which gave us a great cause for concern. Together with GDPR, ICO and Cyber Essentials also making the headlines. We therefore realised we seriously needed to address these things and we engaged with our IT support provider Concise to guide us through the process of becoming complaint. Initially Concise conducted an audit of our network and from the results we were concerned at the number of possible vulnerabilities that existed. These vulnerabilities were swiftly remediated. We are also going through the process of becoming Cyber Essentials compliant again with the assistance of the Concise Protect team. Being compliant isn’t a one-off event. It is on-going and through the Concise Protect service, which enables us to keep compliant and protected. I am reassured knowing that our IT security needs are fully managed. I would highly recommend the security services offered by Concise Technologies Ltd. "